Shakespeare on Film (December 3-January 5) showcases 10 films that were chosen out of 1,189 currently listed on IMDb.com based on the Bard’s work. The criteria to present this series included keeping the language rooted in Shakespearean language and to include only one version of each selected play, and only one film by each director. Featured are Orson Welles’ Chimes at Midnight; Joss Whedon’s Much Ado about Nothing; Al Pacino and Ralph Fiennes in The Merchant of Venice; Leonardo DiCaprio and Claire Danes in Baz Luhrmann’s William Shakespeare’s Romeo + Juliet; Peter Brook’s King Lear; Helen Mirren, Diana Rigg, and Judi Dench in A Midsummer Night’s Dream; Laurence Olivier’s Richard III; Roman Polanski’s The Tragedy of Macbeth; Kenneth Branagh’s Hamlet; and Elizabeth Taylor and Richard Burton in Franco Zeffirelli’s The Taming of the Shrew. Tickets to each screening--unless stated otherwise—are $11/general admission, $7/students, $6/Film Center members, and $5/Art Institute of Chicago (AIC) staff and School of the Art Institute of Chicago (SAIC) faculty, staff, and students. Friday 2:00 pm matinee tickets are $8/general admission and $5/Film Center members and students. All tickets may be purchased at the Film Center Box Office. Both general admission and Film Center member tickets are available through the Gene Siskel Film Center’s website www.siskelfilmcenter.org/content/tickets or through the individual films’ weblinks or visit www.siskelfilmcenter.org of $1.50 per ticket. The Film Center and its box office are open 5:00 to 8:30 pm, Monday through Thursday; 1:00 to 8:30 pm, Friday; 2:00 to 8:30 pm, Saturday; and 2:00 to 5:30 pm, Sunday. Note that the Gene Siskel Film Center’s theaters will be closed on November 24; December 24, 25, and 31; and January 1. Film Center members pay $6 per screening to the No Borders film/lecture series. Admission to November 20’s National Theatre Live Encore: War Horse is $14/general admission and $8/students and Film Center members. A Gene Siskel Film Center membership is a year-round ticket to great movies for only $6 per screening! Memberships are $50 (Individual) and $80 (Dual). For more information, call 312-846-2600 or visit http://www.siskelfilmcenter.org/membership. (Los Angeles, CA) –Angelenos have long demonstrated an appreciation for the finer side of the world of automotive beauty and innovation, and now one of the UK’s most successful classic car shows is gearing up to take Los Angeles on the ultimate trip down automotive memory lane at the Classic Auto Show, presented by Autogeek.com & McKee’s 37 and powered by Velocity, January 27-29, 2017 at the Los Angeles Convention Center. The 2017 Classic Auto Show is set to be the ultimate experience for any auto enthusiast. There is something for everyone, including a Celebrity Theater featuring the classic auto industry’s biggest names, the nostalgic Grand Boulevard – a ‘catwalk’ of the finest and rarest classic, muscle and historic cars in the world – and the extensive auto swap meet where you’ll find rare old parts, books, manuals and a variety of other impossible-to-find items. Whether one’s interest is in the exciting celebrity theater, the Grand Blvd or the auto swap meet, there is something for every gear head or even casual admirer of vintage automobiles. At the Celebrity Theater, some of the biggest names in auto will hold court over three days, providing behind-the-scene insights on how their shows are produced and expert advice on restoration and motoring, as well as photograph/autosigning sessions. Celebrity guests include Velocity TV’s own Chip Foose and Chris Jacobs of Overhaulin’, Dave Kindig of Bitchin’ Rides, Mike Brewer of Wheeler Dealers, Wayne Carini of Chasing Classic Cars and Mike Phillips of Competition Ready. Plus, Bruce Meyer, the show’s Grand Marshall and iconic classic car collector will lead ribbon cutting ceremony and feature cars from his private collection. On display will be restored vehicles representing all decades of automotive history including cars presented by Private Collectors and some of Southern California’s best car clubs and vintage auto dealers. Representatives from Austin Healey Club of Southern California, International Thunderbird Club, Jaguar Owner’s Club of Los Angeles, Orange County Mustang Club, Road Kings of Burbank, and San Fernando Valley Model “A” Ford Club, plus hundreds more will be on hand to answer fan’s most complex questions about their favorite automotive brands. A vibrant exhibit floor will showcase all makes and models of classic cars, plus car enthusiasts will be able to explore the latest products and services needed to keep on motoring. Exhibitors include: Autogeek.com; McKee’s 37; Hagerty; BBK Performance; Odyssey Battery; Shell X; Borla Exhaust; Masterson’s Auto Care; Tub O’ Towels; Akzo Performance Industries, Inc.; Sikkens; Thread Wizard; Kicker; GREX; Reelcraft; Heacock Classic; Castle Country RV; MetroVac; Chequered Flag; Bernal Auto Style and Hillbank Motor Corporation, plus many more. The Classic Auto Show is supported by media sponsors including: DuPont Registry; Historic Vehicle Association; Old Cars Weekly; Vintage Road Car; Vintage Race Car; ClassicCars.com; Auto Round-Up; SoCal Car Culture and Los Angeles Magazine among others. Presented by Autogeek.com & McKee’s 37 and the Velocity Network in tandem with Urban Expositions and Clarion Events, The Classic Auto Show will take place on January 27-29, 2017 at the Los Angeles Convention Center: South Hall. Tickets are available online. Adult tickets start at $25 pre-sale and $30 at the door. Children ages 3-12 are $10 pre-sale and $12 at the door. Children 2 and under are free. Enter promo code: CASPR to save $5 on tickets. For more information please visit www.theclassicautoshow.com. Based in Kennesaw, GA, and founded in 1995, Urban Expositions produces and manages a portfolio of 36 events. Urban serves seven industry sectors including Gift, Souvenir, Art, Aviation, Foodservice, Pet and Gaming. Urban also produces Airport Revenue News, a publication focused on the airport concession industry. Urban has offices in Shelton, CT and Boca Raton, FL, and is represented by employees in California, Colorado and Illinois. For more information, please visit www.urban-expo.com. Clarion Events operates over 200 events in 35 countries from offices in the UK, South Africa, USA, Brazil, Germany, Singapore, UAE, Turkey, and the Netherlands. Clarion can trace its roots back to 1947 and takes great pride in being one of the oldest independent event organizers in the UK. The teams at Clarion create uniquely effective and stimulating environments that can serve as a platform to build businesses, enhance customer relationships and accelerate product awareness. For more information, please visit www.clarionevents.com. Copyright © 2016 Ann Flower Communications, All rights reserved. CHICAGO (November 22, 2016) – This New Year’s Eve, JW Marriott Chicago (151 W. Adams) invites locals and visitors alike to ring in 2017 with the most elegant New Year’s Eve Soiree in the city. The landmark, luxury hotel in downtown Chicago makes it easy for guests to enjoy all the necessary party perks under one roof for a New Year’s Eve celebration to remember from multiple music options, lavish hors d’oeuvres, and more. 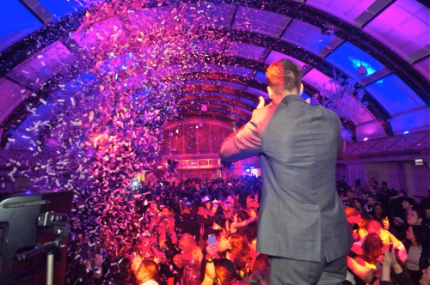 Guests can book their New Year’s Eve Soiree & VIP packages here, with rates starting at $404. Guests who book a New Year’s Eve package on Saturday can also book additional room nights for Friday and Sunday with a special promotional rate. The 20.17% discount is exclusively available to guests who book a New Year’s Eve package. Partygoers will partake in multiple rooms of entertainment with live music from local cover band Stache and the city’s hottest DJs on the turntables. Guests will enjoy top shelf drink offerings, lavish hors d’oeuvres and buffets created by Executive Chef Michael Reich, and a midnight Champagne toast complete with a confetti cannon. For full party details, visit www.chicagonewyearsparty.com. Individual tickets are available for purchase excluding an overnight stay. To book the New Year’s Eve Soiree or New Year’s Eve VIP package, visit www.marriott.com/hotels/hotel-deals/chijw-jw-marriott-chicago. *Packages are non-refundable & non-changeable after 24 hours of booking. JW Marriott is part of Marriott International’s luxury portfolio and consists of beautiful properties in gateway cities and distinctive resort locations around the world. These elegant hotels cater to today’s sophisticated, self-assured travelers, offering them the quiet luxury they seek in a warmly authentic, relaxed atmosphere lacking in pretense. JW Marriott properties artfully provide highly crafted, anticipatory experiences that are reflective of their locale so that their guests have the time to focus on what is most important to them. Currently, there are more than 75 JW Marriott hotels in over 25 countries; by 2020 the portfolio is expected to encompass more than 115 properties in over 35 countries. Visit us online, on Instagram, Twitter and Facebook. STOP Foodborne Illness, the Chicago-based national advocacy and education organization, will honor three Food Safety Heroes at an interactive fundraising event 7-9 p.m., Tuesday, December 6 during the Food Safety Consortium at the Renaissance Schaumburg Convention Center (1551 Thoreau Drive N, Schaumburg, IL 60173). The benefit is open to the public. Guests will enjoy live jazz, cocktails and hors d'oeuvres in celebration of three exceptional individuals who have had an impact on making food safer for everyone. Additionally, there will be a silent auction with proceeds going toward STOP Foodborne Illness. Items include a signed baseball from 2016 World Series Champion and National League MVP Kris Bryant; a guitar signed by musical legend Paul McCartney; another guitar signed by Eddie Van Halen; Robert De Niro memorabilia, and more. These keepsakes make great last minute holiday gifts for friends and family and can also be bid on before the event, now through noon on December 5th, online. Tickets are $65 per person and can be purchased here. STOP would like to thank Food Safety Tech and Walmart Corporation for sponsoring the evening and for their relentless efforts to make the world a healthier place by raising awareness of food safety and providing safe, quality food for customers. Jeff Almer (of Savage, MN) will be accepting the STOP Foodborne Illness 2016 Legacy Tribute award in memory of his mother, Shirley, who died from Salmonella in 2008. Dr. Robert Tauxe (of Atlanta, GA), director of the CDC's Division of Foodborne, Waterborne and Environmental Diseases in National Center for Emerging and Zoonotic Infectious Disease (NCEZID), will be honored as the STOP Foodborne Illness 2016 Advancing Science for Food Safety Hero. Scott Horsfall (of Sacramento, CA), on behalf of California Leafy Greens Marketing Agreement (LGMA), will be recognized as STOP Foodborne Illness 2016 Excellence in Food Safety Training Heroes. Learn more about the event and the three Food Safety Heroes being honored. STOP Foodborne Illness is a national, nonprofit, public health organization dedicated to preventing illness and death from foodborne pathogens by advocating for sound public policies, building public awareness and assisting those impacted by foodborne illness. For more food safety tips please visit http://www.stopfoodborneillness.org/awareness/. If you think you have been sickened from food, contact your local health professional. For questions and personal assistance, please contact STOP Foodborne Illness' Community Coordinator, Stanley Rutledge, at srutledge@stopfoodborneillness.org or 773-269-6555 x7. Follow STOP news at http://www.newsline360.com/stopfoodborneillness. This exclusive event will include an exhibit featuring images of Hip-Hop legends, photographed by Timothy White, Danny Clinch, Janette Beckman, Clay Patrick McBride and others. There will be a performance by Darryl "DMC" McDaniels featuring songs from Run-DMC. The evening will include a showing of iconic/never before seen Hip-Hop footage from films, videos and photo shoots that literally brings back the essence of that era. It's so much more than a party. It's an experience. EAST, Miami is Swire Hotels' first venture into North America, following the openings of EAST in Hong Kong and Beijing. Created for unconventional travelers looking for a fun and relaxing place to stay, EAST, Miami offers distinctive experiences for those seeking innovation, style, and personalized service. EAST, Miami offers 352 guest rooms to include eight suites and 89 one, two and three-bedroom Residence Suites (fully equipped apartments with kitchen, laundry facilities and full access to the amenities and services of the hotel). Guests can expect keyless entry, paperless check-in and check-out, a native App with locally curated insights and travel tips, art exhibits, health and wellness programing and array of other happenings to make them feel totally at EAST. The hotel boasts its signature restaurant Quinto La Huella; a poolside bar & lounge and a rooftop destination bar called Sugar; 20,000 square-feet of meeting and banquet rooms with bay and city views; a 20,000 square-foot outdoor pool and deck (with four different pools) which can be used for private events; a lobby café and bar, Domain, and a 24-hour fitness center. Located at 788 Brickell Plaza, Miami, Florida 33131, the hotel is centrally located within a 15-minute drive from the Miami International Airport, and situated on top of Brickell City Centre - conveniently connected to popular districts such as Wynwood, the Design District, and South Beach. For reservations please email reservations@east-miami.com or call 305-712-7000. For more information, please visit http://www.east-miami.com/.